10 Common English Grammar Mistakes & Errors made while learning English. I was correcting the English test given to my students and notices so many Common English Grammar mistakes made by almost every student in my class. That brings me to this English lesson today. Although these common English mistakes are made unknowingly but if you want to speak English fluently and confidently then you need to avoid these common errors in English. I have hand picked such 10 mistakes in English, that learners make in British English or American English, these are quite common, and if you are studying for IELTS or TOFEL, you are sure to lose your points. 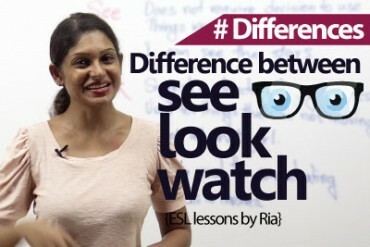 So this is your chance today to correct your English mistakes and improve your English. Hello everybody, this is me Meera and I welcome you back. Tell me one thing, looking at this board do you think that oh! I will not watch this, I already know these sentences but hold up, because if you’re saying that you know all of these sentences and you know them, you think that they’re right, then you need to go through this lesson till the end because guys all of these are wrong sentences right here. 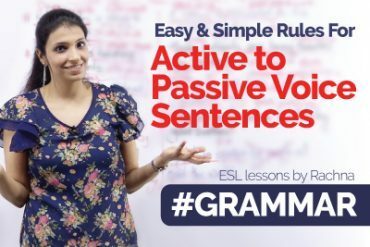 I have picked up few common grammatical errors that English learners make, in fact English speakers usually end up making, while speaking in English or while learning English. I will identify, I’ve identified those for you and I will tell you how to correct them right here. So let’s begin, “my good name is” do you find yourself saying “myself” or “my good name is” “my good name is Meera” is incorrect then what is correct? “My name is Meera” or just keep it simple and say, “I am Meera” simple? Now this I don’t want you to do especially for people who are going for job interviews or placement interviews, try and avoid introducing yourself on the phone or personally as my good name or in myself keep it simple and keep it right. Moving on “I am 30 year old” What? Are you a 30 year old bowl? A bottle? No. Usually when human beings are telling for how long they have lived, it is always plural. “I am 30 years old” Do not make this mistake I am 30 years old or you can also say, “I am a 30 year old lady”. Here I have taught you to use ‘a’ and use singular form of year which is just without an ‘S’. I am a 30 year old lady. You have to make sure that you complete the sentence if you are using ‘a’ and year. Moving on, “my cousin brother” “my real sister” Well I will tell you what, remember this and fix it in your head that in English we only have cousin or we can have cousins and then we can have a sister don’t use words such as my blood sister or my real sister that doesn’t mean anything that just means you’re trying to prove something that is non-existing in English. So all you can say is ‘elder’, right? ‘Younger’. We’ll just keep it ‘sister’, which is you can probably add an objective my annoying sister, right? But avoid saying my cousin brother, my cousin sister. It’s just cousin or cousins, got that? Moving on, “me and my friend”, “I and my friend”. We usually end up saying me and my when, me and my friend went to a park. Me and my friend were partying. Well I will tell you what, you will never use me and my friend. First of all it is always polite to introduce others in your sentence. So what is the right way to say it? “My friend and me” and the real grammatical reason for this is that, whenever you have a sentence such as, “the teacher gave my friend and me the homework.” The sentence has to be complete without any disturbances. For example, “the teacher gave the homework, for, well let’s change the sentence, “the teacher gave the homework, to my friend and me” here if you cut the sentence, you can still complete it “the teacher gave homework to my friend.” ‘Full stop.’ “the teacher gave the homework to me.” ‘Full stop’ and that is also how you can combine the sentence another reason why, “my friend and me” similarly “my friend and I” that is how you would use it. Moving on guys, “I will give you an information”. Information starts with the letter ‘I’ it obviously comes in the vowels, so you would think obviously it’s, there’s a vowel there, I will put ‘an’ as an article. But hey, ‘information’ belongs to uncountable nouns you cannot count it. That’s a rule here and to be able to complete this word the typical way of understanding a vowel is that it has to be in a continuous free-flowing flow the sound of the word but here ‘in’, in is the sound making it a word or a noun that you cannot use ‘an’ for, okay? It is uncountable and here you cannot use ‘an’. Moving on, “I will give you information” add an objective, “I will give you some information” that is something that you can probably add, ‘some’, right? Great! “One of my friend, is going to NASA”. Alright, what’s the problem here? You might think there’s no problem, but there is, let me tell you what, whenever you say ‘one of’ whenever you say one off literally I’m not joking my ears pop out whenever anyone says or uses one of because whenever you are using one of that means you’re talking about a lot of things. Out of those many things that one thing is what you’re talking about. My five fingers, one out of my five fingers, plural. Similarly one of my many friends. Remember this, fix it, it’s going to help you. Whenever you’re using ‘one of’ always known that there is plural coming immediately after that. One of my pets, one of my friends, one of my brothers, always plural. Remember, will you remember that? Perfect, let’s move on, “let’s go for walking”, now what’s the problem here? You cannot use “verb’ plus ‘ing’ when you’re talking ab, when you are looking at ‘for’, why is because there is a rule for it. Instead the right way to say it “let’s go for, a walk”, “let’s go for a walk”, “let’s go for a ride”, let’s go, let’s go for riding is also incorrect. Will you remember this? Because this is easy, great. Moving on to the next sentence “I drove my bike very fast, to reach here”. Now you are seriously doubting, if I’m saying the right thing? But I am, because a very tiny mistake ‘bike’ is always ‘ridden’ not ‘driven’ and that is how the sentence, sentence becomes incorrect so, bi, I, “I drove my bike very fast rich here” is incorrect “I rode my bike very fast to reach here” it’s the past tense of ‘ride ‘. Did you get that? Yes, it’s not a grammatical mistake, but it’s a vocabulary mistake and that also comes under grammar, okay? Let’s go ahead, “he drives for his office every day.” Again, he drives for his office every day is not the right sentence why because ‘for’ is not the right preposition here. What’s the right preposition here? And that is ‘to’. This is the correct preposition here. “He drives to his office every day”, “he drives to work every day”. Here whenever you talk about another movement or a motion that is where you use the, the preposition ‘to and not ‘for’. I hope you will remember this because we are moving to the last mistake which I have for you guys today. “The flight is leaving in ten minutes.” Now we have a tense problem here. What is the tense here? The right tense to use here is ‘present simple tense’ and why? Because whenever you’re talking about any schedule, a timetable, a pre-planned activity, you would use present simple tense and this sentence automatically becomes, “the flight leaves in ten minutes”, right? So we have converted this sentence which is a pre-planned timetable, scheduled activity and made it into a present simple tense and that is the correct way to go about it. So that is all I have for you guys today. I have so much more to share with you, so I’m going to come real soon back right here to meet you to talk to you guys to share more thoughts. Until then keep practicing, keep smiling, spread love, this is me, Meera signing off for the day. Ciao. 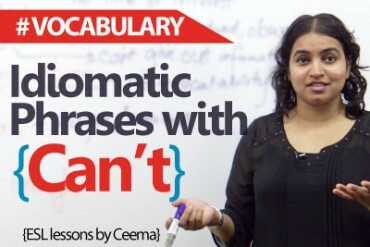 10 Idiomatic Expressions with the modal verb ‘Can’t’.